In the early aughts, consumers were losing faith in fast food, or at least that’s how John Vincent remembers it. Eric Schlosser had released his book “Fast Food Nation,” a damning look at the quick-service industry. At the same time, consumers were increasingly embracing the Mediterranean diet as a more-healthful alternative to burgers and fries. “There was a growing sense that fast food in general had gone a bit array in terms of not necessarily feeding the well-being of the individual,” he said. 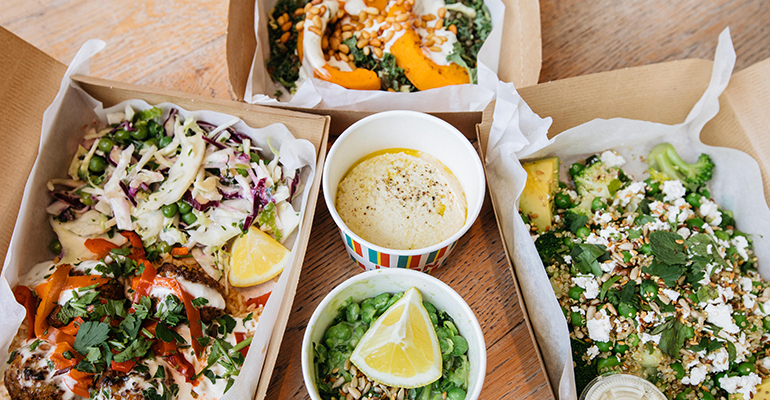 Vincent saw an opportunity for a different kind of chain serving “naturally fast food.” So he created the restaurant concept Leon and opened the first location in London in 2004. The brand was built around five principles: The food had to “taste incredibly good, be remarkably good for you, allow you to feel good after you eat it (because sometimes with fast food you don’t always feel great after you eat it), be affordable and kind to the planet,” Vincent said. Now, after much success in Europe, he’s venturing to the U.S. with plans to open a Leon in Washington, D.C., in late summer. But will American diners crave the brand’s grilled halloumi wrap and Moroccan meatballs the way they do in the U.K.? The menu will be the same as it is in Europe, at least at first. This includes breakfast of porridge pots and fair-trade, organic coffee. A lunch and dinner menu of “hot boxes” — cooked food in boxes — wraps and burgers, with Leon’s popular baked fries. To drink: juices, lemonade and Kefir smoothies, although many patrons take advantage of the free water, said Vincent. 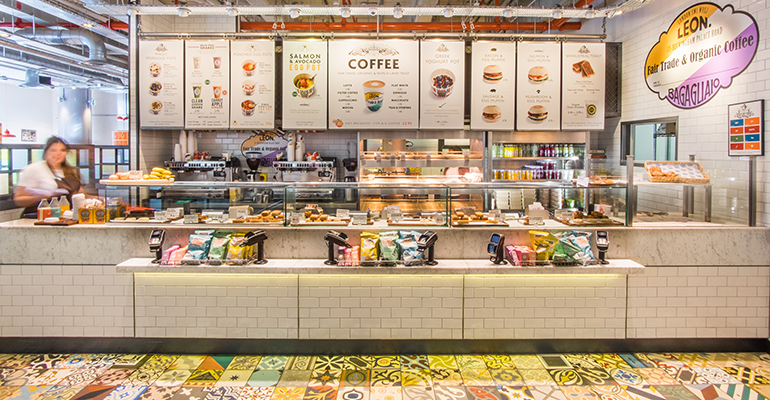 In the U.S., Vincent imagines he’ll be competing more with fast-casual chains than quick-service chains, although he is adamant that his brand is fast food. Prices are a bit higher, though because “traditional fast food is stable through the supply chain it’s easy to freeze and manage.” LEON uses fresh local ingredients. “I think we’re going to be about 10- to 15-percent higher than McDonald’s,” he said. “But surely we’ll be cheaper than fast casual, as you can easily spend $14.” Leon’s average check in the U.K. is $7.50. Since 2012, former Olive Garden president Brad Blum has also been an investor in the Leon concept. He also sits on Leon’s board. Blum and partner GP Investments Ltd. recently formed a new entity, FoodFirst Global Restaurants, Inc. Blum is owner / partner, chairman and CEO of FoodFirst Global Restaurants, which acquired Brio Tuscan Grille and Bravo Cucina Italiana. GP Investments is also a lead investor in Leon. In the U.S., Vincent expects a challenge, but he’s always had big plans for his brand. From the start he wanted to recreate the future of fast food. “The idea that came into my head was the idea that if God did fast food,” he said. Mortals, at least, seemed to have approved of his brand. Today there are 52 company-owned and franchised Leon locations throughout the U.K. and Europe. “My real goal, yes, of course, I have to run a food company, is to be a good force of good,” he said, but as much as monetary value can measure success, each restaurant on average generates $38,000 in revenue per week, according to the company. The average McDonald’s in the U.S. generates roughly $51,352 per week, based on Estimated Sales Per Unit from Nation’s Restaurant News’ Top 200 data.